Published: June 3, 2012 at 04:03 p.m. 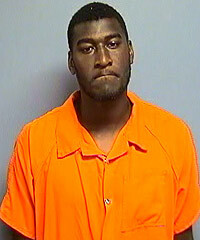 The story behind Justin Blackmon's Sunday morning DUI arrest in Stillwater, Okla., isn't getting any prettier. Stillwater police spokesman Capt. Randy Dickerson confirmed to NFL.com that the former Oklahoma State wide receiver smelled of alcohol when an officer pulled him over shortly after 3 a.m. local time. Blackmon agreed to take a breathalyzer test and blew a .24 -- three times the state's legal limit. Under Oklahoma law, a BAC above .15 constitutes the charge of aggravated DUI. It can be prosecuted as a felony or misdemeanor. Blackmon, the Jacksonville Jaguars' first-round draft pick, and the fifth player taken overall, was released from jail Sunday afternoon on $1,000 bond. He's due in court Monday. Stillwater police tried to pull over Blackmon for speeding -- he was clocked at 60 mph in a 35-mph zone -- and driving left of center early Sunday morning, they said. Blackmon drove about four blocks before stopping in a gas-station parking lot. There was no one else in the vehicle with him. Blackmon had been scheduled to appear in Houston on Saturday to sign autographs, but the event's promoter wrote on Twitter that the receiver wouldn't attend because of illness. Not a good situation for Blackmon or his new team. It will be interesting to see the legal road ahead for Blackmon, who's now a two-time DUI offender.